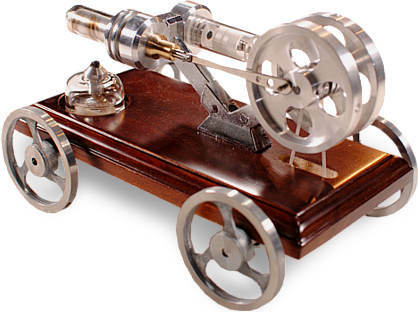 Stirling Engines are an efficient engine cycle developed in 1816 by Robert Stirling. They can basically use any heat source and are more efficient than steam engines. 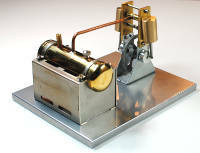 We currently have a Basic Stirling engine as shown on the left, a similar engine that runs a LED light, one that runs on hot water, and one that powers a vehicle.. If you are looking for a easy to use durable demonstration engine we recommend starting with this traditional cycle. We carry Alpha and Beta-type Stirlings, Ultra Low-temperature Stirlings that run on as little as the heat of your hand; As well as other engine types which mainly operate on the basic principles of the Stirling cycle, including Thermoacoustic and Manson Cycle Engines. 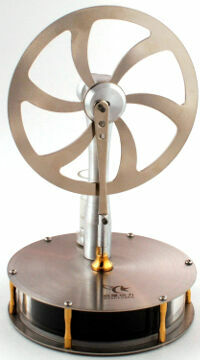 Visit our How Stirlings Work page for an explanation of the basic operation of the Stirling engine. And please visit our Full Catalog of Products to see the many tabletop engines we carry for home, hobby, and educational use. 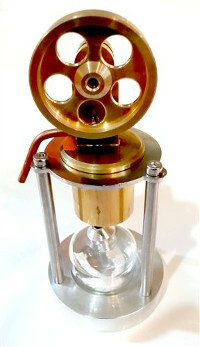 Steam Engines - Selling Out Soon!